The dual rear cameras bring an excellent portrait experience to everyone. With A5, no longer do you need that other camera. Instead, get a stunning cover shot portrait photo with one simple click. Like your personal beauty artist, Al selfie can recognize your features and then beautify them using its powerful algorithm. Whether you are snapped with your other half or in a mixed group, Al Beauty 2.0 uniquely adapts for each person. Smoother UI transitions, multitasking, and switching between apps are all supported by the enhanced 64-bit Snapdragon Octa-Core CPU. 4GB RAM and 32GB ROM, along with 14nm processing, it brings a faster, fluid and energy-saved operating experience. With an elegant back cover that catches the eye with a subtle yet mesmerizing interplay of light and shadow from different angles, OPPO A5 ticks all the design boxes. Featuring 2 bold, Diamond Blue and Diamond Red colors, the A5 is a genuine style accessory. The 15.74cm ( 6.2 ) super full screen stimulates the senses across all your everyday mobile phone experiences. Also with a new 19:9 aspect ratio, the A5 gives you an all-round superior view. The new ColorOS 5.1 brings forth a brand new UI system and operation interface. Simple, friendly and faster, it's refreshing in every sense of the word. Time to light up your party! When you want to amp up your music, theMusic-Partyfunction can offer a fun solution for you and your friends. Open up a hotspot, and your friends' phones can be connected immediately to play the same track. 1. A5 equips with 8MP front camera. 2. 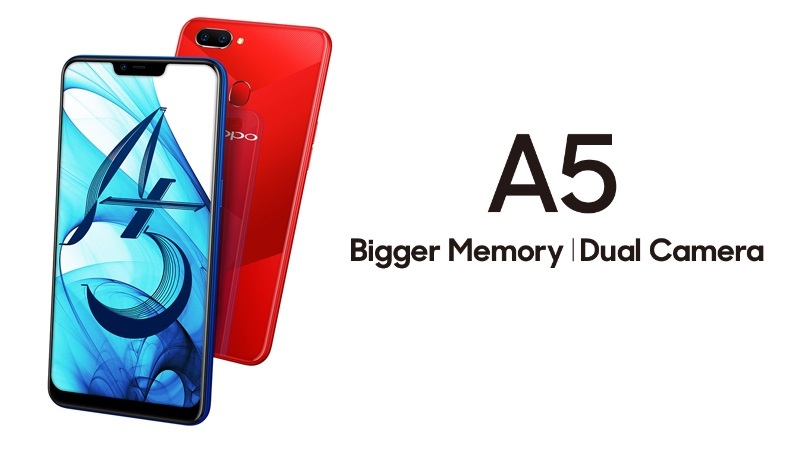 Memory of A5 is 4GB RAM + 32GB ROM. 3. Typical battery value of OPPO A5 is 4230mAh. 4. The length of the diagonal of the screen is 15.74cm ( 6.2 ) when the four corners of the display are stretched at right angles. (The actual visible area would be smaller. 6. Facial Unlock speed may differ based on the actual situation.